We currently have two litters of kittens. Both are sired by RW SGC Mainefolds Little Bear (cream BS) See photo and pedigree on Stud page. Smitten and Beyonce both have kittens born in Oct and sired by Little Bear. More information to come! Beyonce and Smitten are expecting litters in early October sired by RW SGC Mainefolds Little Bear , cream British Shorthair. Kittens may be available at Christmas to responsible homes. Photo collage of sire Kokomo (Momo), daughter Solange, and dam Beyonce. 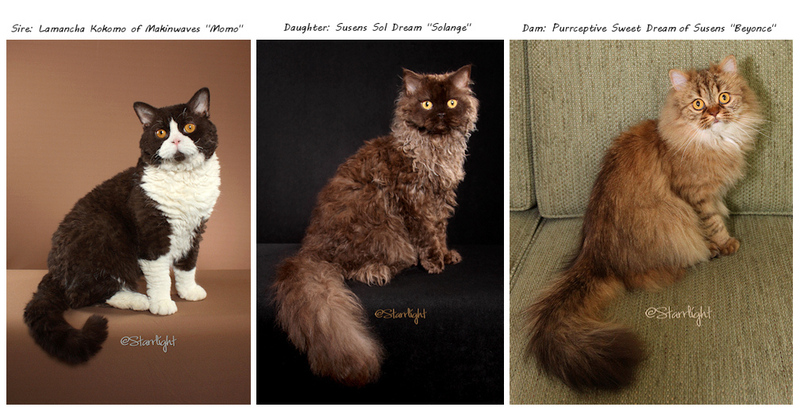 New webpage in the works for SuSens Cats!